The Heat King uses only centrifugal pumps for the field and circulation loops. Safer than positive displacement pumps, they are engineered to eliminate dangerous pressure situations. A powerful 290,000 BTUH burner. By using a coil for the heat exchanger, we are more durable and rugged than the competion who use boilers meant to be stationary. 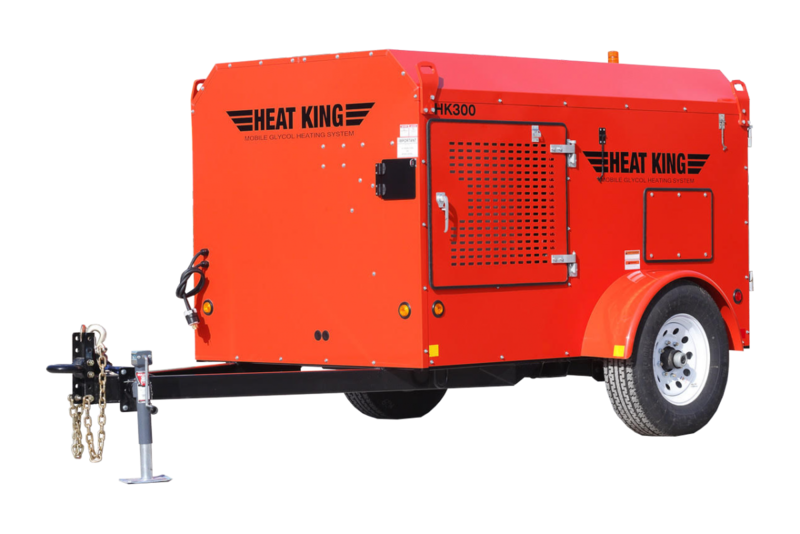 The Heat King’s trailer features a rugged uni-body design and 5000lb torsion axle for better towing. All doors can be locked during operation protecting the Heat King and any tools or equipment inside from tampering or theft. The Heat King’s powered reel holds all 2800 feet of hose. Operation is controlled by a heavy duty CSA & UL approved foot switch leaving the hands free to control the hose. The Heat King features digital temperature control and monitoring. With a touch of the button on the control panel, the Heat King’s output temperature can be changed in increments of 1 anywhere between 0-180 F.
All Heat King control panels feature large switches that can easily be used even with winter gloves on. The panel has a large emergency stop button that immediately stop all functions of the Heat King and a ground fault interrupt (GFI) breaker protect the entire system.